It was a fight even Manny Pacquiao's closest advisers warned he would lose. His opponent hailed from a formidable political family. And the last time the Filipino boxing sensation ran for public office, he lost badly. But on Monday, May 10, Pacquiao won a seat in his country's Congress  and won it by a landslide. "A Congressman!" he says with a grin, clearly still grappling with the concept, as he exchanges hugs and handshakes with staff at "the Pentagon," the code name for his two-room campaign headquarters in General Santos City. "It's the first time in history." And what a concept  not just for a tyro Congressman from Sarangani, a remote province in the southern Philippines, but for the sport that brought this local boy fame and riches. "I don't know of any major boxer who has also been a politician," says his promoter Bob Arum, 78, who joined Pacquiao on his campaign trail. The last time Pacquiao was considered the underdog was in 2008 when he fought his hero Oscar De La Hoya. Then, as now, he demolished his opponent. U.S.-educated businessman Roy Chiongbian was twice his age and had never run for office, but his family had dominated local politics for three decades. Like almost every other candidate during this election, Pacquiao campaigned on the familiar issues of poverty and corruption. "I know what poverty is," he told villagers in Malandag during his last rally. "I come from a poor family." This simple message resonated. Pacquiao won big not just in Kiamba, where he spent part of his youth, but in other areas of Sarangani previously considered Chiongbian strongholds. Arum, who once represented Muhammad Ali, was rhapsodic  and not just because promoting "the boxing Congressman" will do wonders for those pay-per-view figures. "Ali was a wonderful person, but it was more about Ali," says Arum. "This kid spent a fortune running for office. And he did it not to aggrandize himself but because he really believes he can make a difference." But for a 31-year-old boxer who has already fought more rounds than "Sugar" Ray Leonard and whose mother is vocal about his quitting the sport, politics is also a retirement plan. Several Filipino sportsmen (mainly basketball players) have won public office, which ruthless and wily politicians can convert into wealth and influence. Congressman Pacquiao insists he just wants to help his people. 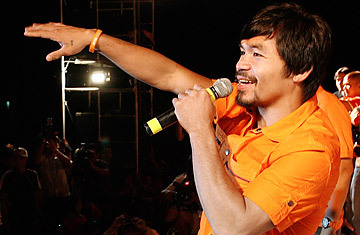 "Without their support, there would be no Manny Pacquiao," he says. Maybe. But a nagging irony of the campaign is not lost on local journalist Edwin Espejo. "Pacquiao ran on an antipoverty platform yet spent millions of dollars," he says. "He has raised the bar with election spending." One Team Pacquiao insider admits the campaign cost at least 300 million pesos ($6.6 million), a small fortune in this impoverished province. It is a price Roy Chiongbian either couldn't or wouldn't pay. "Chiongbian folded," says Espejo, choosing an apt metaphor  Pacquiao is a passionate card player. The boxer's supporters argue that financing his own campaign will make him a better Congressman since he will not owe any debts to special interests once in office. Meanwhile, Arum promises that legislative duties will not interfere with Pacquiao's boxing schedule. The boxer keeps in good shape, he says, and Congressmen in the Philippines "don't exactly knock themselves out at work." Pacquiao's extraordinary career could be crowned as soon as November by a much anticipated clash with undefeated American welterweight Floyd Mayweather. The fighters will likely share a record-breaking purse of at least $80 million. Who will win is anyone's guess. But Congressman Pacquiao  he's considered the underdog again.